Last semester I taught my department’s highest-level language class for the second time. This class serves as a bridge to subsequent classes that focus primarily on literature, cinema, and other aspects of Hispanic culture. For this reason its syllabus includes a handful of short stories and poems, as well as advanced grammar topics. I’ve always felt at a loss when it comes to teaching literature. This is partly because, as you might expect from this blog, my forte as an instructor is grammar. In addition, while I distinctly remember, and even treasure, the effort it took to master different grammar topics, reading Spanish came naturally to me, and was fun from the start. This makes it hard for me to empathize with my struggling readers and to know how best to help them. I had an “aha” moment toward the end of the previous semester, when a student came to me after class with questions about Mujer negra, a terrific poem we’d read some weeks earlier. We were looking at her copy of the poem as we spoke, and I was struck by the disparity between her obvious effort in reading the poem — she had looked up so many words! but not always correctly! — and her lingering doubts, even though we’d already discussed the poem in class. I knew that if we were to sit down together and go through the poem more carefully, I could help her understand it better. But what instructor has the time to do this with every confused student — assuming they request it? And isn’t it our goal to teach our students to read literature without professorial hand-holding? 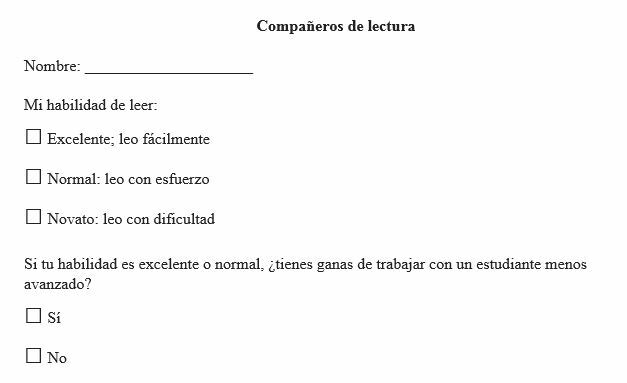 Accordingly, this semester I came up with the idea of assigning each student a “reading buddy” (compañero de lectura). The plan was that the students would work through each reading together, and optionally complete a joint homework. I hoped that this would help students to (i) understand the readings better, (ii) improve their reading skills, and (iii) see reading as a serious and time-worthy task. I assigned the readings buddies semi-randomly. First, I asked students to fill out a short form (below) in class. I also asked them to indicate if there was anyone in the class they would especially like to work with. Almost all the students described their reading ability as “normal”, and all of them expressed willingness to work with a less advanced partner. I assigned buddies on the basis of this information. At the end of the semester I administered a brief survey to gauge how useful students had found found this approach, and to decide whether I should repeat it the following semester. Overall, the results was positive. There are two ways to look at them. First, as shown below, half of the sixteen students surveyed chose to work with their reading buddy on at least half of the semester’s four readings. Of students who didn’t work together, most cited scheduling conflicts; only four students said that they preferred to work by themselves. I was surprised that scheduling was such a big factor. Overall I was encouraged, and I will definitely repeat this program. However, now that I know that scheduling is such a concern, I will encourage students to get an earlier start on each reading as it begins to loom in the syllabus. 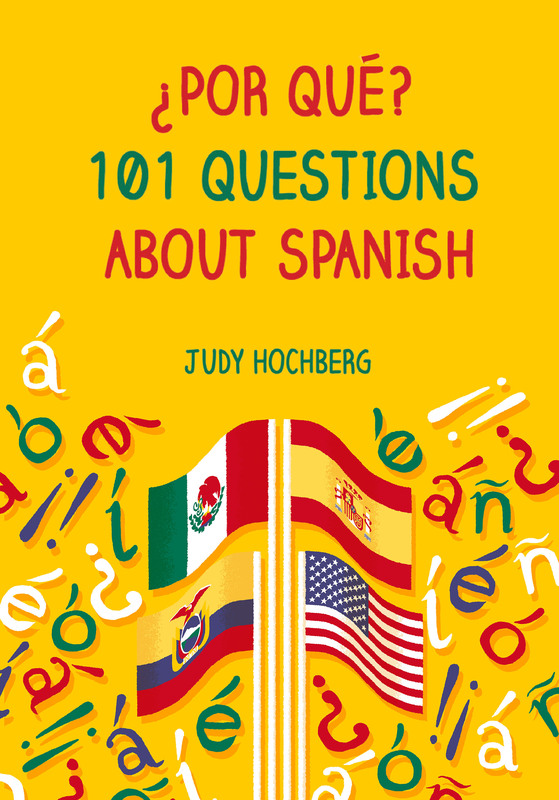 This entry was posted in teaching Spanish on 6 February, 2018 by jhochberg. In college, I studied in Spain and Chile, where I became fluent in Spanish and discovered my love of writing and journalism. My passion led me to pursue a Masters in Communications from Stanford University, then to a job in journalism. I moved to Newport News in 2000 with my husband Paul, a NASA engineer. We decided Newport News was the perfect place to raise our two daughters, Georgia and Tessa. I became a Spanish teacher at their school, Hilton Elementary, and found my second passion: teaching. How cool is that? ¡Felicidades to Shelly! This entry was posted in teaching Spanish and tagged Newport News, Shelly Simonds on 19 December, 2017 by jhochberg. Vocabulary: to gloss or not to gloss? Everybody knows that flossing is good for you. But what about glossing? The Spanish textbook series we currently use at Fordham University is Pearson’s Gente. The beginning and intermediate books in the series provide glosses, or translations, for the vocabulary list at the end of each chapter. But the advanced textbook does not. There is a Spanish-English glossary at the end of the book that students can use to look up words. glosses that are correct but not necessarily satisfactory, such as ‘commitment, engagement’ for compromiso (leaving out that it’s often a pre-marital engagement) or ‘offer’ for oferta, where the usual meaning involves a special price. 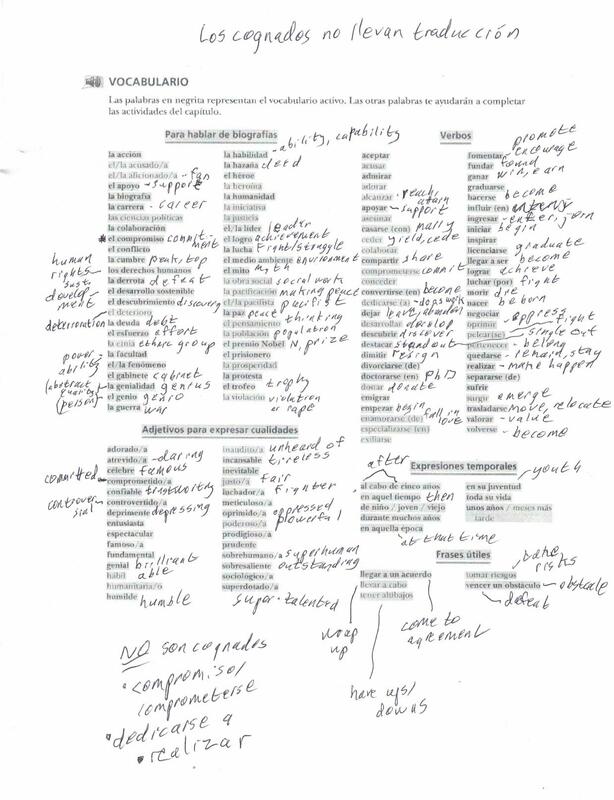 So this semester, at the beginning of each chapter I gave the students a screen shot of the vocabulary page on which I had written on my own glosses. I photocopied these onto yellow paper — a teaching trick I picked up somewhere along the way. Here’s an example: my original, hence not yellow. Note that I don’t generally gloss cognates. This drives home their ubiquity, and also makes false cognates stand out. When I told a colleague about my approach, she was mildly horrified. She thought that it was important for students to look up the glosses themselves, and that this was their first step in learning vocabulary. I believe that while it’s beneficial to use a dictionary while reading, and that this is a special skill that we need to teach our students, looking up 100 words, in alphabetical order, in a simple glossary is fundamentally different. It’s mechanical, rather than intellectual, essentially a secretarial task of collating two lists. In this follow-up post, I describe my students’ unanimously favorable assessment of the glosses. This entry was posted in teaching Spanish, Vocabulary and tagged cognates, false cognates, glosses, Pearson, Teaching vocabulary on 5 December, 2017 by jhochberg.